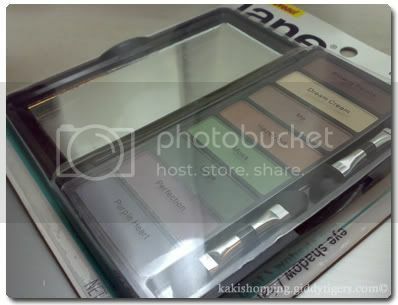 My good gal pal told me that if I ever had a chance, one of the affordable brands of makeup I should try in the US is Jane.Â Of course, I could never resist that suggestion, and so when I made my recent purchase with drugstore.com, I decided to add an eye shadow set to my order.Â I chose theÂ Jane Eye Zing Eye Mixers in Nirvana. Initially, I had only wanted to purchase the single-colored shadows, but I couldn’t make up my mind which to get, so I thought I would just try the Eye Mixers, which had EIGHT different shades to mix and match with.Â After all, I have never before finished using my eye shadow, so this combination of different shades would suit me perfectly, since it has a little bit of each color for experimenting. The set came with 2 eyeshadow applicators, each with 2 applicator sponges on either end.Â The colors that came with the Nirvana set ranged from neutral brown hues to greens to blues, and they are all contained in a compact case, complete with mirror.Â Upon opening the case though, some of the color cases got dislodged, but no biggie, I just merely had to push it back in place. The first time I used the eye shadow, I found that I had to rub the applicator really really hard on the surface of the color just so it could grab some color.Â And when I applied it on my eyelids, it stung a little.Â I thought perhaps the applicator was too hard or something. So the next time, I used my fingertips instead.Â But that did not help much because it didn’t grab a lot of color.Â I tried wetting the applicator a little bit before applying, but there really wasn’t much of a difference. Although the color combinations are excellent, I find they hardly stay on for long.Â When I use my eye makeup remover to remove my eye shadow at the end of the day, I find that only my undereye concealer can be seen on the cotton pad I am using.Â I tried applying the eye shadow on top of an eye shadow base, and it only helped a little.Â Not a big problem for me, because I hardly ever wear HEAVY makeup, but if you want your eye makeup to last forever, this is not a good choice. That being said, I went green yesterday and used the green tones on my eyelids.Â I only used my fingertips for blending.Â This time, applying the eye shadow with the applicator did not sting my eyelids as much, and the color lasted the whole day, though again, it didn’t show up much when I removed my makeup.Â All in all, the Jane Eye Zing Eye Mixers did not wow me off my feet, but I would say is a good staple to have on the go, simply because of its wonderful combination of colors. This set retails at $6.99 but sometimes you could get it on offer for much cheaper.